Watershed coalitions try to achieve restoration from the floods and river resilience. The rivers and streams in Larimer County area beautiful natural resource that is also critical infrastructure for our economic development, recreation and is a source of life for our communities and agriculture. 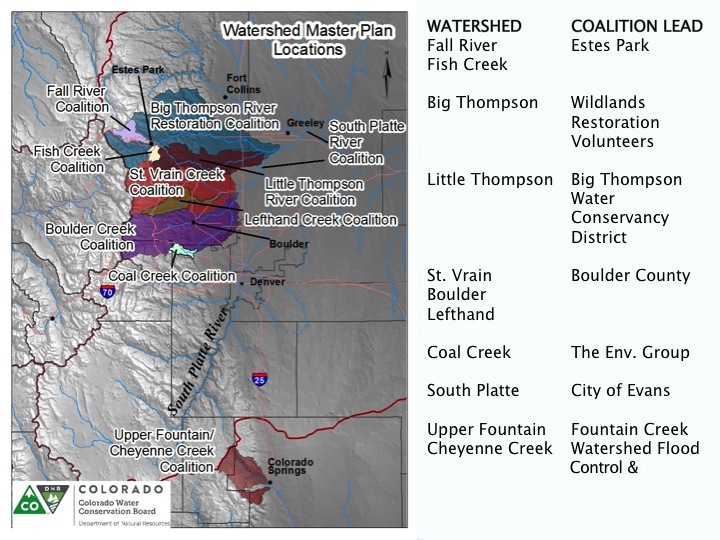 There are over 75 watershed groups in Colorado. 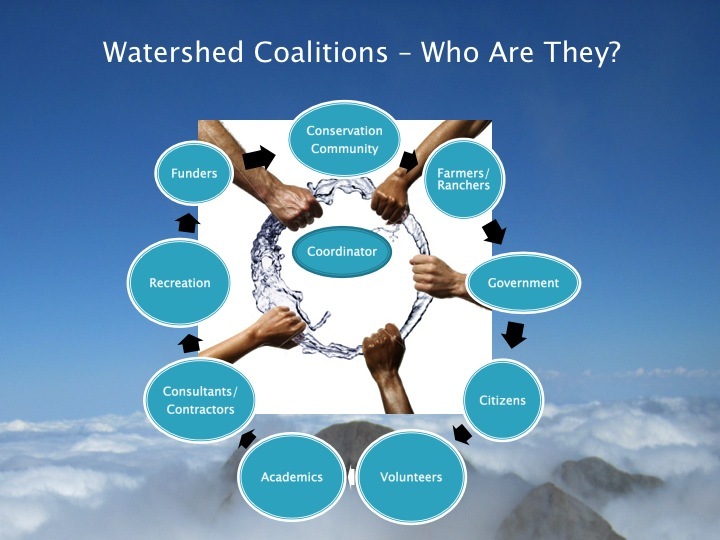 Here are the regional watershed coalitions who are actively working to restore our rivers after the 2013 floods. Video: Iain Hyde from the Governor's Recovery Office gives an overview of the watershed and river restoration coalition master plan. This video was taken during the August 2014, Roadmap to Recovery Expo in Estes Park. The Little Thompson Watershed Coalition is a group of landowners and stakeholders in the Little Thompson watershed. The LTWRC is working to restore the Little Thompson Watershed following the disastrous floods of 2013. Coalitions and Collaboratives, a non-profit organization that supports multiple watershed coalitions is the primary fiscal agent for the LTWRC. The Big Thompson Conservation District also provides sponsorship for the LTWRC on specific projects. For updates and to get involved, please visit the LTWRC website. The Big Thompson River Restoration Coalition (BTRRC) is a coalition of government, private landowners, and non-profit organizations working to implement restoration of the Big Thompson River after the flooding in September 2013. BTRRC has established teams of technical advisors to visit sections of river, providing ecological and restoration recommendations for rapid response and long-term efforts. BTRRC also aims to obtain resources and recruit volunteers for approved restoration projects along the Big Thompson River corridor, and sign stakeholders up for participation in long-term restoration projects. In addition, the BTRRC facilitates communication between stakeholders and agencies that provide funding and/or authorization for river restoration projects. For updates and to get involved, please visit the BTRRC website. river as a problem that must be fixed, the coalition sees the river as the linchpin in the solution. The Fish Creek coalition takes a Watershed Approach to recovery and planning. A watershed approach addresses problems in a holistic manner and all stakeholders are actively involved in selecting the management strategies that will be implemented to solve the problems. It coordinates community actions through the development of a common vision. For updates and to get involved, please visit the Fish Creek Coalition website. The Fall River Coalition is working on a master plan in partnership with the Fish Creek Coalition. For updates and to get involved, please visit the Fall River Coalition website.